Development Specialists, Inc. has been a leader in acting as the Assignee for the Benefit of Creditors in cases across the country for over 40 years. Since its inception, DSI has been guided by a single objective: Maximizing value for all stakeholders. With our highly skilled and diverse team of professionals and an unparalleled range of experience, and with offices throughout the United States and Europe, DSI not only achieves that objective, but has also built a solid reputation as an industry leader. 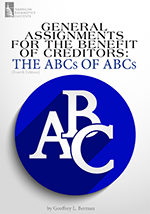 General Assignments for the Benefit of Creditors: The ABCs of ABCs by Geoffrey Berman. Strategic Alternatives for Distressed Businesses by Jonathan Friedland.